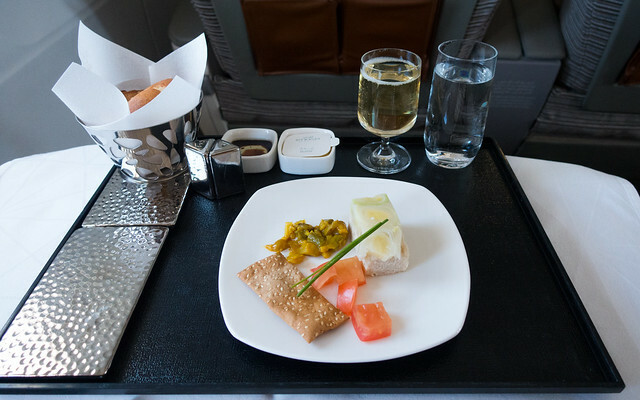 We didn't particularly stop for the hotel breakfast--we expected Etihad to have some feast laid out in one of their two lounges. Sadly, we chose poorly: we started at Terminal 3, which was OK but not stunning , so we wanted to see the other lounge--which ended up being smaller and more cramped, with almost no seats. Ah well, first world problems. 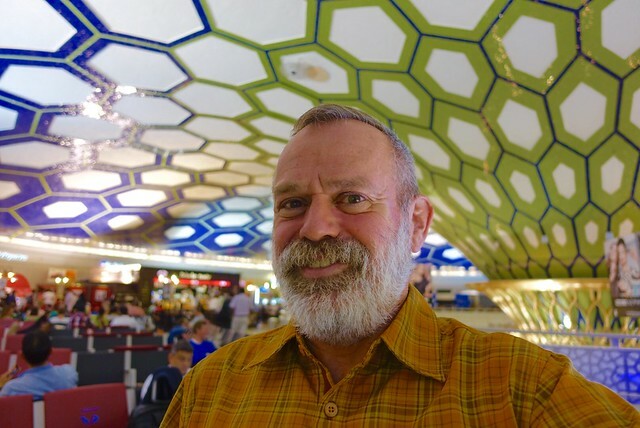 My buddy Quebec Carl told me to check out the psychedelic mushroom of Terminal 1 , which was a sight to see! The feast really happened once the plane took off around 9:30 for the four hour flight, with the breakfast first course, then the breakfast second course, then would you like bread? And a light lunch? OK, ok, enough with the yummy food! 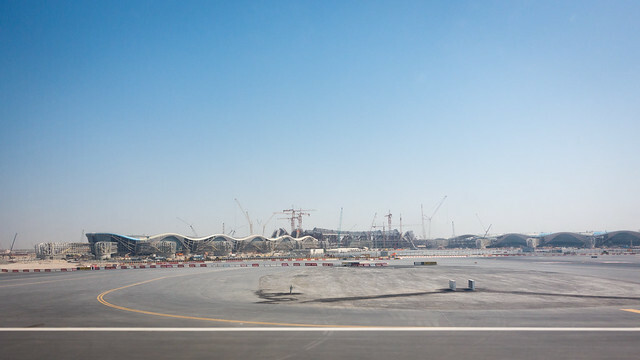 The scenery out the window was pretty interesting as well... the new Abu Dhabi terminal under construction was interesting to look at. Then we passed directly over Dubai, then through eastern Iran and up through Uzbekistan, making a right turn to avoid the Afghanistan border. The landscape was pretty arid the whole way--desert and steppe country--but as we got close to Almaty farms and trees appeared. What? 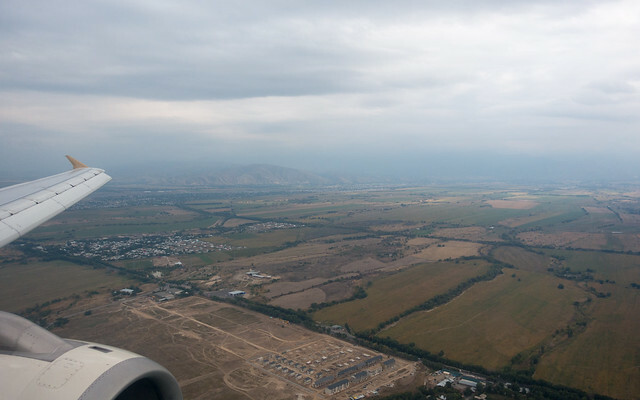 It looked odd to me, as did the very high snow-covered peaks behind Almaty. I guess I expected something that looked more like Salt Lake City than, oh... I don't know, Zurich? We landed, passed through the very Euro-like customs check (red lane for things to declare, green lane for just 'keep on walking'), and found our driver to the hotel outside. Once in central Almaty, it definitely felt European too, some unknown part of eastern Europe with those Soviet-inspired streets with double lines of trees and four story apartment blocks. But Almaty isn't in Europe at all, it's as far away as Cincinnati is from Los Angeles, and closer to Mumbai than Moscow. During World War II, it was considered sufficiently remote enough that the Soviets moved a lot of industrial operations there for the war effort, which really helped the city grows. 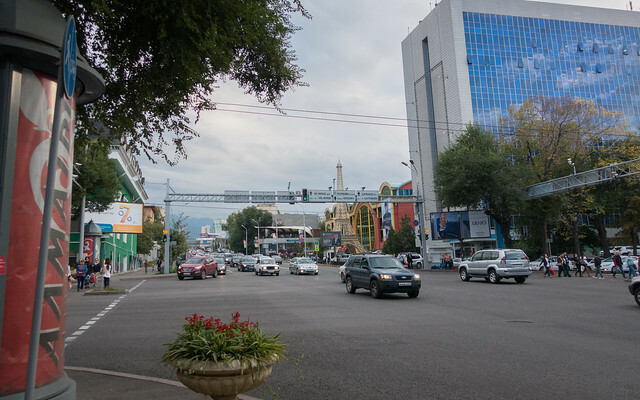 Now Almaty is growing rapidly as Kazakhstan's economy booms with oil, gas, and mineral deposits, enough to cause ugly traffic jams of fancy new cars. It's the commercial center of the country, which is about the size of western Europe. 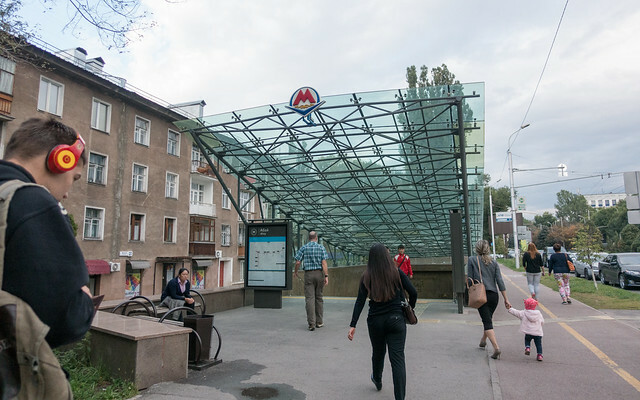 Anyways... we decided to go out and about on Almaty's metro, which was started in the late 1980s right at the end of the Soviet era... and completed in 2011. It's got the huge stations with the triple-tubes and the fancy themeing, so it was a fun excursion. 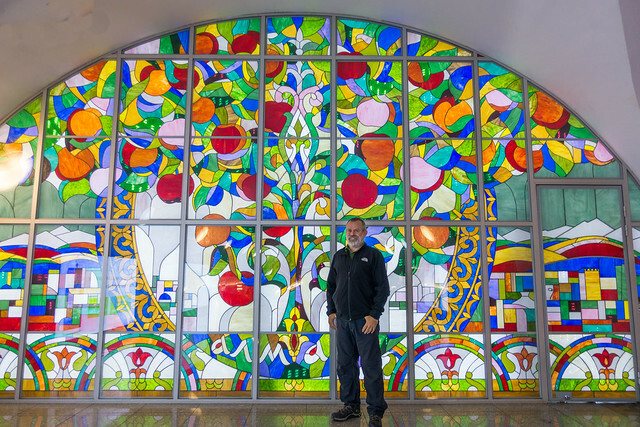 I liked the apple stained glass window in one of the stations, as apples are native to this area--"alma" means apple in Kazakh. We met up with our tour group at a local microbrewery, where we sampled some adaquate beer and meats (the horse steak was delicious), and then headed back to rest up. We're jet lagged, and have a whole day of touring ahead of us in the morning, so it really is time to rest up.